We all know that we should eat our fruits and veggies, and many of us also know the importance of eating whole grains for optimal health. But do you know the health benefits of nuts and seeds? Studies have shown that individuals who regularly eat 1-2 servings of nuts and seeds per day generally live longer. 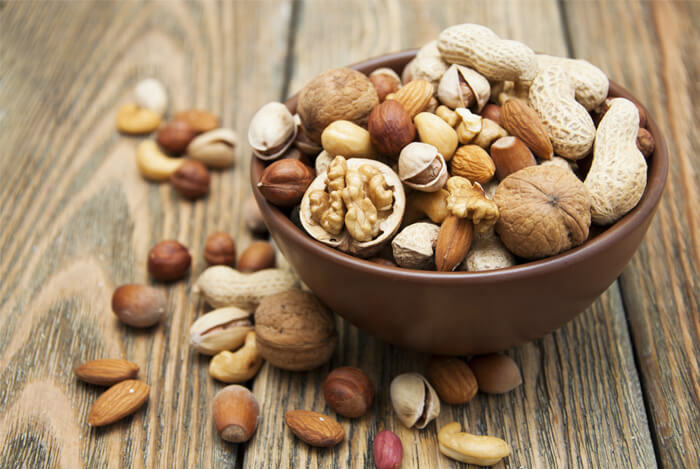 Whether that’s specifically because of nuts, or nut eaters just stick to better habits in general, is not clear. But it does bode well for nuts. Nuts and seeds are also wonderful sources of protein, vitamins, and many minerals such as iron, zinc, and magnesium. Nuts taste absolutely delicious all on their own and can help train your taste buds to enjoy the taste of higher fiber sources of protein and healthy fats. Adding just 1 – 2 ounces of nuts and/or seeds per day is all you need to get the benefits these foods have to offer. One ounce of most nuts and seeds is the equivalent of a small handful or 2 tablespoons of nut butter. Here are five different nuts and seeds that can help you live a longer life and enhance your meals at the same time! 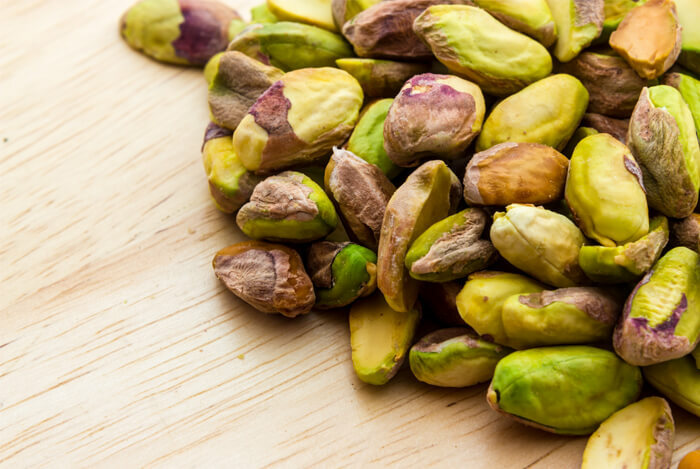 Let’s start with one of the most popular types of nuts and seeds that have been shown to improve multiple facets of health. Almonds are a wealth of protein, iron, vitamin E, fiber, magnesium, vitamin B6, the mineral manganese, and they’re a great source of copper. Here are some great ways you can use raw almonds or raw almond butter if you haven’t already tried them. Eat an ounce with an apple for a snack. Pumpkin seeds are also incredible sources of iron, protein, magnesium, and fiber. But aside from their health benefits, pumpkin seeds also taste delicious and are easy to find just about anywhere. 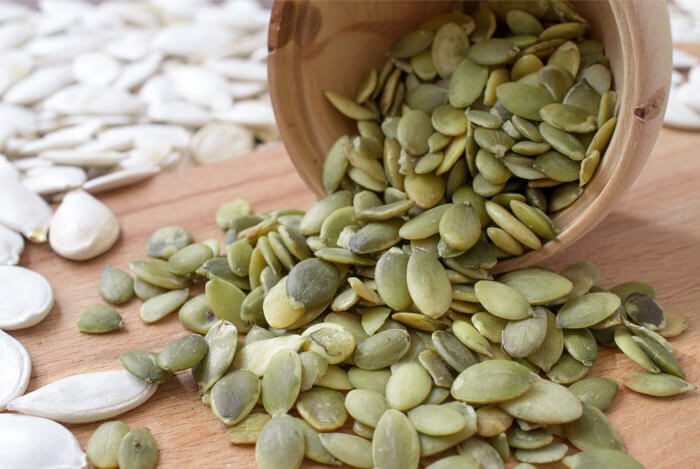 Pumpkin seeds can also be bought in their shells, which is great if you’re looking for a similar snack to sunflower seeds in their shell. However, if you’re just looking to toss the seeds into recipes or use them as a topping, purchase them unshelled for easy access. You can find pumpkin seeds online and at your local health food store. They’re very affordable per serving and a little will go a long way towards crushing an afternoon craving! Cashews aren’t a true tree nut and they’re actually closer to legumes in how they grow. Cashews are part of the drupe family of plants which grows from the ground similar to the way peanuts (another legume) do. 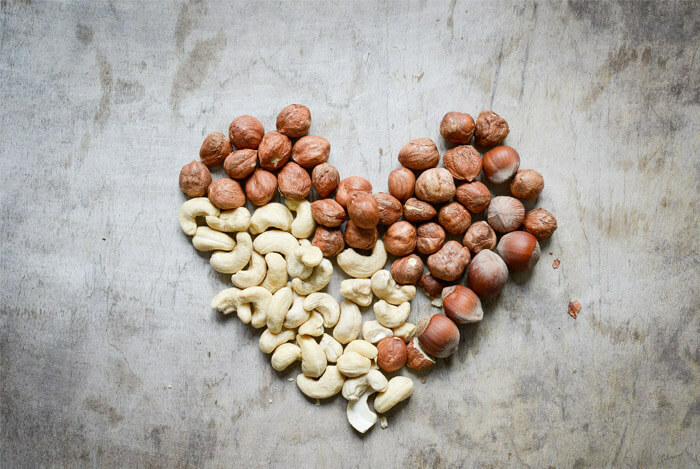 However, cashews hold many of the same valuable health benefits of other nuts and seeds. They are extremely good sources of iron, magnesium, Vitamin B6, and monounsaturated fats. Per serving, they’re also lower in fat per serving making them good for people watching their overall fat intake. When soaked and blended, cashews turn into a thick and creamy spread that can be used in place of cheese or even butter. 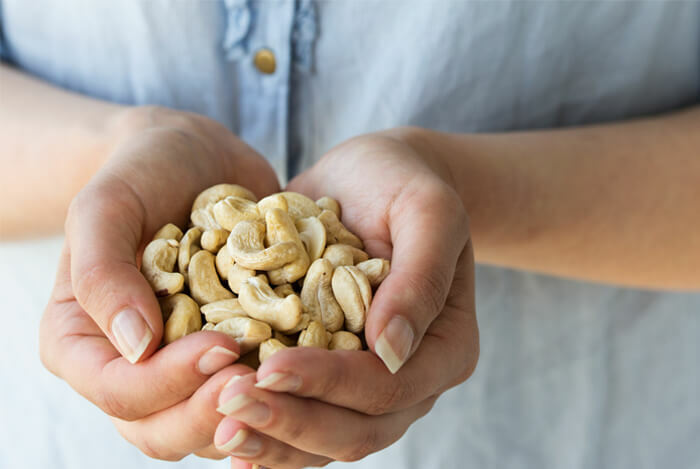 Raw cashews are very affordable and will also provide a milder taste to recipes when you’re looking to use them in place of dairy. You can find them at any health food store or online for just cents per serving. Pecans are some of the most overlooked nuts and seeds that offer tremendous health benefits in many different ways. They’re excellent sources of energy and contain many vitamins, minerals, and antioxidants that make them worthy of being in anyone’s diet. Like almonds, pecans are high in monounsaturated fats and they help improve cholesterol levels by lowering LDL (bad cholesteroL) and improving levels of HDL (good cholesterol levels). 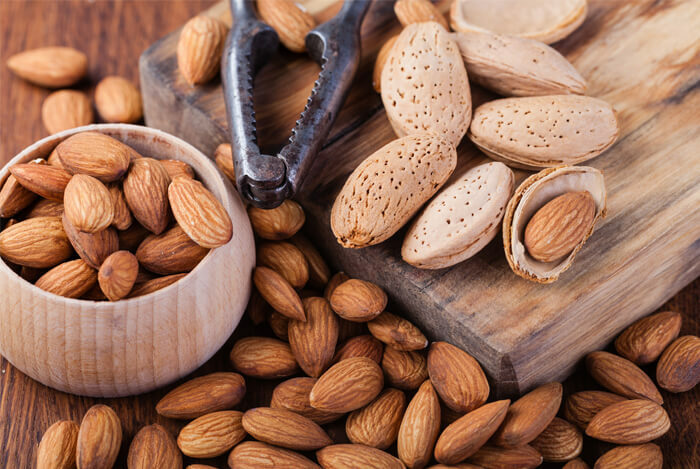 They’re also packed with magnesium, iron, calcium, selenium, and zinc like almonds and pumpkin seeds. 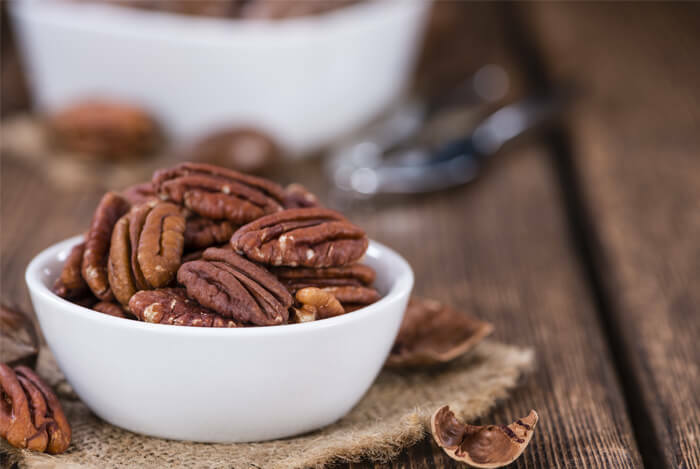 If you’re not lucky enough to live near a pecan tree and get them fresh during the fall season, then be sure to pick up some raw pecans that are shelled next time you visit your local health food store. You can also find raw pecans online very affordably, and most companies that sell them offer high-quality options. Like other nuts and seeds, you can now find pecans in the form of a spreadable nut butter. Raw pecan butter is readily available from many high-quality brands both in stores and online. Add them to your next lunch for an extra boost of protein! Sunflower seeds don’t just make a great ballgame snack; they’re also easy to add to just about any meal or snack you can think of. Plus, these seeds are one of the most nutrient-dense seeds you can get your hands on too, offering fiber, magnesium, protein, iron, Vitamin E, copper, zinc, and many B vitamins in just a small serving. Their earthy, nutty, and slightly sweet flavor also make them easy to enjoy. 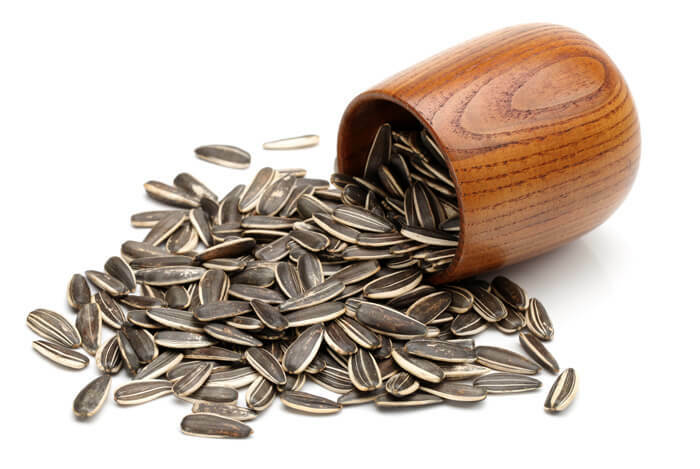 Sunflower seeds are very easy to find in their raw state and they’re one of the most affordable nut and seed options on the market. You can also find sunflower seed butter which tastes somewhat similar to peanut butter and is used as a replacement to peanut butter for those that have a peanut allergy. All nuts and seeds should be included as a part of a healthy diet, but like all fats, be mindful of serving sizes and how they affect your digestion and energy. Try adding an ounce of raw nuts and seeds to your daily diet and see what benefits they can offer you. What’s your take on nuts and seeds? Have anything else you’d like to share? Let me know in the comments below!